It’s that time of year again where we search for the perfect presents for family and friends. Below I am sharing some of my favorite gifts that they will actually want and USE! This 100% natural beauty cream feels luxurious and helps keep your skin moisturized during the harsh winter months. Plus it smells amazing! This is the best natural exfoliant for my sensitive skin. Use the code 10PIB5 for 10% off your order. I love including this planner as part of my weekly & daily journaling. Best part is it emphasizes living a whole life instead of just being productive which is true self-care! Great stocking stuffer for the wellness and self-care lover in your life, dry brushing helps improve circulation and exfoliate your skin. Incorporating a jade roller into my beauty & wellness routine has been a great way to slow down and take the time for me. The cool jade feels great morning or night. I use this skillet everyday for cooking everything from my morning eggs to reheating leftovers. It’s durable and oven safe too so it’s great for roasting in the oven too. Perfect for your market loving friend, this 100% cotton toe is durable & stylish. I know the Instant Pot is all the rage but this is the pressure cooker I use and I have no complaints! It also has slow-cooker and yogurt settings too. Know someone who likes to keep a clean and stylish kitchen? Then gift them this Create Beautiful Food Tea Towel. 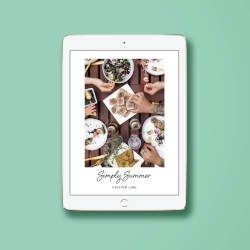 Simply Summer Cookbook (Digital Edition) by ME! It might be chilly now but summer is never far away! If you order as a gift, leave a note during checkout and I will include an email and print friendly card perfect for gifting. An easy first step to reducing kitchen waste, these all natural wraps are perfect for sandwiches, wrapping pieces of cut fruit or cheese.